The Thalia cinema was built in the mid-1950s for the Tuschinski movie theatre concern at the intersection of Kruiskade and the Lijnbaan shopping precinct. Its fan-shaped auditorium borders on one side of the Lijnbaan where it forms part of a row of shops. The billowing facade sports an ornamental concrete sculpture and an entrance marked by a glass vestibule. The interior seeks to recreate something of the eloquence of the pre-war Tuschinski theatres. 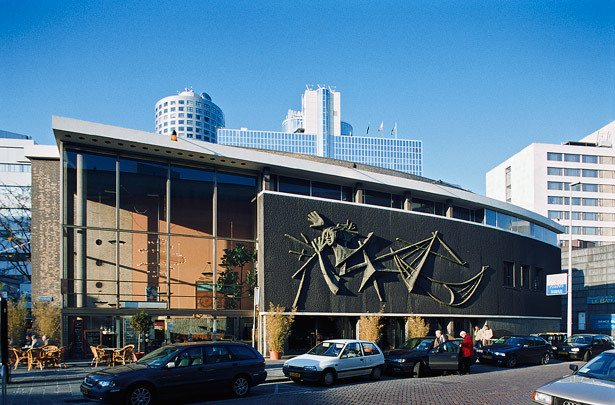 When the cinemas on Kruiskade relocated to the multiplex on Schouwburgplein the Thalia building seemed destined for demolition. But in 2002 the auditorium and foyer re-emerged as the Thalia Lounge chill-out and dance club.